"Tokyo rocked to the beat of a wild party today when Nissan launched the new GT-R…underground, in the soon-to-be opened Yamate roadway Tunnel. 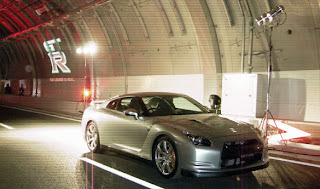 Yes, welcome to the “Tokyo Underground Night Nissan GT-R X Shutoko Yamate Tunnel,” a wacky, all-guns-blazing launch party for the GT-R, on the eve of the new 480 horsepower superhero going on sale, in Japan, on Thursday, December 6. Tokyo has a mass of overhead roadways that form the Shutoko expressway, roads which circle the city and in parts also dive underground. Ah yes, but the Shutoko also happens to be a legendary late night raceway for gearheads with pumped up GT-Rs, Evos and STIs (also featuring on several video games). It is, you could say, Tokyo’s very own answer to Detroit’s Woodwood Avenue.